Rushing to catch a train this morning I wasn’t expecting this. I don’t use public transport much, because here in the Dutch Boondocks public transport is pretty bad. 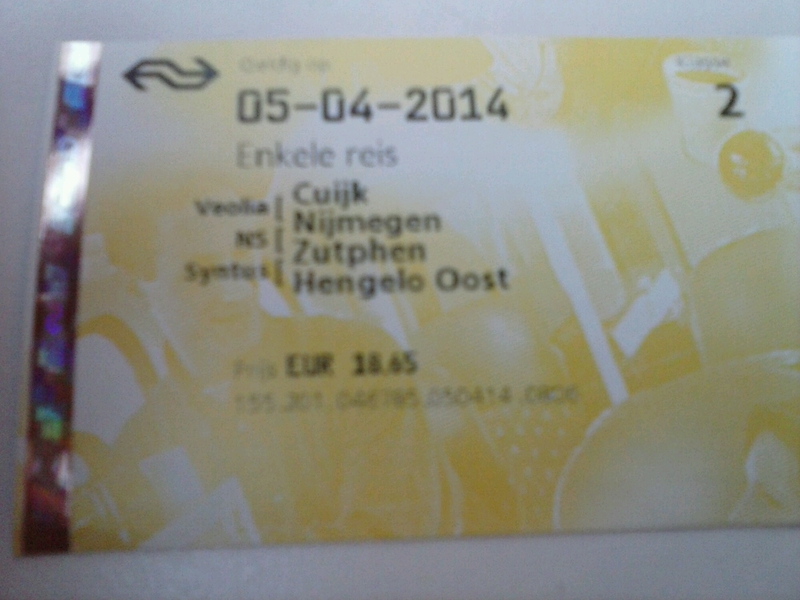 Also, Luddite that I am, I use paper tickets and not a card with a chip in. Got a suprise this morning at the ticket machine. A price rise of €1.25 on my usual journey and I have to choose the route I’m taking. So. I’m stuck on this route and can’t deviate from it if I miss a connection? I can understand Nederlandse Spoorwegen trying to encourage people like me away from paper tickets, but a more complicated ticket machine when the train is in sight is just a scunner NS, a scunner. This entry was posted on Saturday, April 5th, 2014 at 7:02 am	and tagged with Netherlands, Public transport and posted in Netherlands, Public Transport. You can follow any responses to this entry through the RSS 2.0 feed.